Back in January I wrote about my first-time experiences making yogurt at home. 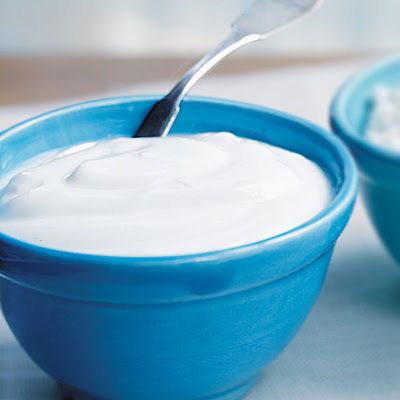 I've been enjoying home-made yogurt ever since, whipping it up about once a week. However, it's about time I updated my original recipe, since I've learned a couple of things that result in better, easier-to-make yogurt. The original recipe called for slowly heating the milk in a saucepan to a slight simmer. Not hard to do, but cleaning out that pan was a real chore and I began to simply hate all that hard-knuckled scouring. So eventually I tried heating the milk in the microwave---and it worked perfectly! 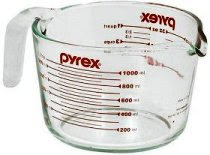 I use a 4-cup Pyrex glass measurer, the kind made of heavy-duty glass. With the milk at the 4-cup line, it takes 10 minutes on High in my microwave to achieve a simmer. 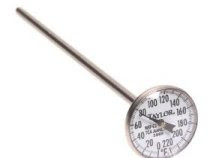 I then remove the milk from the microwave, stick in a liquid thermometer, and wait for the temperature to drop to somewhere between 110-115°. Later, after transferring the milk to a different container for transformation into yogurt (called setting), cleaning the glass measurer is a snap. My plans call for purchasing a 1- or 1.5-quart lidded glass casserole in which I can (1) heat the milk, (2) set it into yogurt, and (3) store in the fridge. This will make everything even easier than it already is. I determined that there was no need to pre-heat my gas oven to get it hot enough to work the yogurt-making magic. I've deleted that step altogether. Along with 2 other deleted steps, the original 9-step yogurt is now a 6-step yogurt. Instead of the original 2 Tablespoons of yogurt to get the new batch started, I now use at least half a cup, usually more. What this does is produce a fabulously thick yogurt similar to Greek-style yogurt...except that I use lowfat milk (1%). Pour milk into a microwave-suitable container. Heat on High until the milk begins to simmer. Time will vary with your particular microwave, but will probably be in the vicinity of 10 minutes. Remove from microwave . Place container on towel or hot pad, and let the milk cool until the thermometer reads between 110-115° F.
Transfer milk to a container for setting and eventual refrigerator storage. Since I set my container in the oven, I use a casserole dish with a lid, transferring it from oven to fridge when it's set. Gently stir 1/2-to-2/3 cup yogurt into the milk, mixing thoroughly. Cover container and place in warm spot or in a gas oven (the pilot light provides all the heat necessary for yogurt to set). Setting takes anywhere from 6-14 hours. When yogurt has set, place in the fridge. Let it sit for a few hours before eating---it will get better and better over the next few days.